My second contribution to Row Three's 'Doomsday Movie Marathon.' Part three of this storied trilogy is due next Sunday, mates. Sequels are like relay runners: when one film stops, it passes the baton of character, plot and possibility to the next film, which continues the journey. The world of the films stays consistent, familiar and the brand, to put it cynically, stays profitable. The director and screenwriter of the new film must account for what came before. 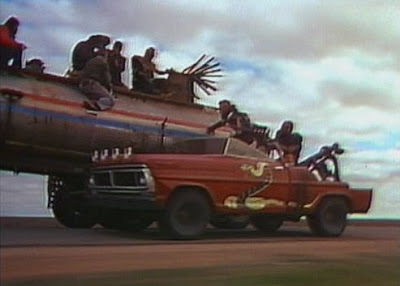 Between Mad Max (1979) and Mad Max 2, however, there is no baton passed; merely a miming of it. There’s Mel Gibson, yes; there’s Aussie accents and the apparently battered remnants of Max’s creep-killing car from the first movie. But otherwise, this second Max occupies a world far more alien to our own. His past is trivia, illuminating nothing. And he occupies a true action film—well-done, but firmly part of its genre, from beginning to end. Both Max’s are dystopian fantasies. Mad Max showed us the world “a few years from now,” in which societal breakdown has begun in earnest. Max Rockatansky, one of the last men to possess both power and a conscience, nevertheless lost everything worth living for. While this first film wasn’t profound, it delivered a hero on the razor’s edge between law and nihilism, and we couldn’t help but ponder him. 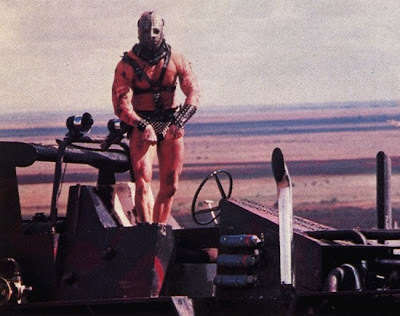 Mad Max 2 is more business-like. It propels us several years ahead, sending Max to a setting that, we presume, his attitude at the end of the first film would naturally have led him. He’s now a well-armed nomad, driving his car through the Australian desert, eating canned dogfood and scavenging gasoline to survive. A roving gang (bigger than the gang in Mad Max, and trading glam for punk this time) preys on him and everything else on the unpoliced roads. A third group, wearing white, maintains a walled town surrounding an oil well. They want to leave the town for the coast, and the gang, of course, wants to penetrate the walls to get the oil. OK, so how’d things get THIS bad? A narrator, speaking over a black and white opening montage, tells us of a war between two great tribes. Their reliance upon oil and all it drove was their folly—when the fuel ran out, the civilizations it supported, buckled. And the politicians, the narrator sneers, just ‘talked and talked and talked.” Talk was cheap enough in the first Mad Max, which blared background music over routine dialogue. It’s worth even less in Mad Max 2. Gasoline, however, is worth everything. Max is grim in its pursuit, and maybe he’d kill for it, though we never see him do that. He needs it to keep driving and driving, but where’s he going? Nowhere in particular, it seems. Notably, the desert he lives in is called the Wasteland, implying that somewhere, the land is not wasted. So why live here, and not there? ‘Here’ has heat and dearth and a gang and its homicidal leader, Lord Humungus, who looks like Jason Voorhees if he left the world of the undead for the world of bodybuilding. It doesn’t seem like a good deal, really. We conclude that the tragic events of Max’s past (reviewed swiftly in the opening montage) have caused him to seek the ascetic life. Whatever, though; the story now is about Max’s struggle to stay alive, and the attempts by the town dwellers to enlist his help. Max no longer sticks his neck out, but there’s no real question that he’ll do what they require of him—if not out of the goodness of his heart, than simply because the movie must deliver its big finale. The town dwellers’ dilemma is this: they have oil, which they must keep, and a population of over 100, who must depart safely from the town’s walls if they want to achieve their new life on the coast. They have a tanker truck to hold the oil (thanks to Max, actually), plus several vehicles to hold the people. They’ll need to make a break for it, and presumably, the gang will target the tanker first. Max has to drive it. We know about this plan long before it’s executed. The gang and the town communicate their opinions regularly, in fact—via megaphone in Humungus’s case. Humungus promises to let the townspeople go if they just walk away from the well. Nobody buys that one. Meanwhile, the town’s leaders debate their escape. Whenever the heads of either side start blathering, the camera cuts to Max, looking pensive and weary, and music blares over their words. The whole film has an aversion to excess, thank god. Director George Miller didn’t let his bigger budget (ten times Mad Max’s) swell his head; as in the first film, no time is wasted on sequences and characters that need not be fully developed. That includes villains one-dimensional enough to be credible cannon-fodder and a refreshing lack of gratuitous explosions. Things (and people) aren’t blown up for the hell of it. And the film’s world is a delight to watch, because it’s so detailed and sensible. The common weapon, for example, is not the gun, but the crossbow, because its bolts can be fashioned more easily than bullets or shells. And when Max comes across a leaking gas-tank on the highway, he not only throws dishes and jugs beneath it to catch the fluid, he also sponges the ground with a rag to get every last drop. He’d have to. 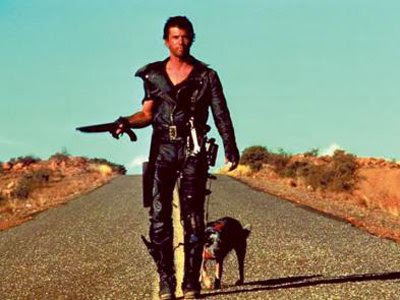 If you like action movies (and I do), you’ll like Mad Max 2. Here’s a movie that knows what it is, knows what we want, and makes them the same. True, the Max of this film is less complex and satisfying than his predecessor, but perhaps that predecessor really is dead and buried. 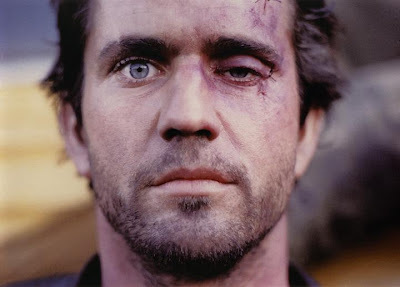 If you’ve never seen Max Rockatansky, you can still know all that’s left of the Road Warrior. Thanks for your website and good Kreative Blogger from kinetografo!